Today’s topic is Nurturing a Culture of Creativity at Home. Be sure to read to the end of this post to find a list of links to the other carnival participants. Then your baby arrives and you realise that yes, you were that stupid. You were prepared for change, but it didn’t really sink in that things wouldn’t be changing back at some point. After all, people often talk about how long it takes to “get back to normal” after having a baby. This of course implies that it’s possible to get back to your old normal. Well I certainly didn’t find it possible to do that. The fact was that life changed when we had children and we had to find a new normal. Like many new mothers, I struggled with my sense of self. When I emerged from the haze of baby’s first year, I felt a need to rediscover the things that made me me. I needed something to help me relax and unwind, without taking time away from my family. And I felt a need to be creative as well. I wanted to be productive in a way that didn’t involve office work, or laundry, or preparing meals. So I found myself turning back to crafts I had learned years before – knitting and sewing, cross-stitching in particular. Cross-stitch isn’t the most creative of hobbies – at least not in the way I do it, always following a pattern. I don’t design anything. I simply pick a pattern, and then follow it stitch by stitch. But there’s something so fulfilling about seeing the image build up on the fabric before me. And I get an immense sense of achievement when I complete a piece. When I was without children, that was always enough to give me a sense of creativity and it filled whatever need I had. But when I found myself coming out the other side of that first year of motherhood, I felt like the crafts I pursued were relaxing but I needed more. I used the pattern-following type crafts to unwind but I needed something more challenging to feel creative. 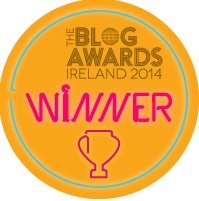 So I found myself turning to blogging. I started writing, and i discovered that I had plenty to say. I spent hours working on site templates, and planning and scripting blog posts. It gave me such an outlet. Now here I am three years on, and my initial fervour has abated somewhat. I no longer post daily. But still whenever I feel the need to reflect or to create, my blog is here. I hope that some day my children will find their own creative outlets. My baby daughter is too small yet, but for my son we have a crafting space, and we often spend a rainy Sunday afternoon doing “family arts and crafts”, making sticky messes of papier-mâché and glue and acrylic paint. It is my wish that he learns to see value in building and creating things himself and perhaps, through the crafts we do, he will find something that he loves and that he can turn to in years to come. 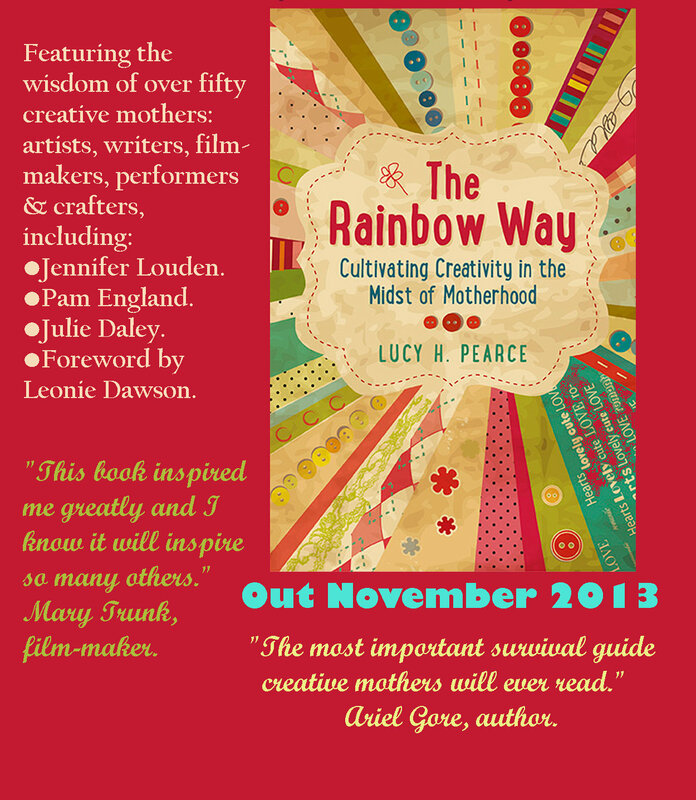 Carnival host and author of The Rainbow Way, Lucy at Dreaming Aloud shares an extract from the chapter Nurturing a Family Culture of Creativity. Lilly Higgins is a passionate food writer. Now a mother of two boys, she’s discovered a new calling: to instil in them a love of food and creativity in the kitchen. DeAnna L’am shares how visioning the New Year with your child is an invitation to be inspired: use creativity and resolutions to create a fun road map for the year ahead. Molly at Talk Birth on Releasing Our Butterflies – balancing motherhood with creativity. Laura shares some of the creativity happening at Nestled Under Rainbows and a few thoughts about creativity. Georgie at Visual Toast celebrates her own unique culture of creativity at home. Esther at Nurtureworkshop spreads the love of the ordinary, the delights of everyday things that can be an adventure of the imagination. For Dawn at The Barefoot Home creativity is always a free form expression to be shared by all in a supportive environment where anything can be an art material. Naomi at Poetic Aperture is a mother, artist and photographer who tries to keep her daughter away from the expensive pens and paints. Aimee at Creativeflutters writes about keeping your sanity and creativity intact with small kids in the house in her post: Mother + Creativity – They Must Coexist. Amelia at My Grandest Adventure embarks on a 30 Days of Creativity challenge…you can too! Becky at Raising Loveliness explores creating with her smaller family members. Jennifer at Let Your Soul Shine reveals how children help us connect to our souls, through music and movement. Mary at The Turquoise Paintbrush shares her experiences of creating with kids. streak – she has found lovely ways of tuning into it every since. Emily at The Nest explores how creativity runs through her family’s life together. Jennifer at OurMuddyBoots sees that encouraging creativity in children is as simple as appreciating them for who they are: it just means overriding everything we know! Lisa from Mama.ie has discovered that a combination of writing and traditional crafts can provide a creative outlet during those busy early years of new motherhood. Anna at Biromums shares what nurturing a culture of creativity means to her. Zoie at TouchstoneZ argues that the less they are interfered with, the more creative children become as they grow up. Darcel at The Mahogany Way celebrates creating with her kids. Sally (aka The Ginger Ninja) of The Ginger Chronicles is continually inspired by her own mum and grandmother. Just being creative is enough, says Nicki at Just Like Play, as she ponders her journey of nurturing a creative family. Allurynn shares her creative family’s musings in her post “Creativity… at the Heart of it” on Moonlight Muse. Laura at Authentic Parenting explores how being creative saves her sanity. Mama is Inspired talks about how she puts an emphasis on the handmade in her home, especially in the holiday season. Kirstin at Listen to the Squeak Inside shares with you several easy ways for busy mamas and dads to encourage their children to be creative every day. Mila at Art Play Day always lived in her dreams, sleepwalking through life … now she is finding out what creativity is all about…. her inner child! Sadhbh at Where Wishes Come From describes how picture books can nurture creativity in young children. On womansart blog this week – nurturing a creative culture at home. Hahaha, so true! That was exactly my thought process! Interesting what you say about your change in creative direction since motherhood, that was a very common thread for a lot of mothers I spoke to when writing the book. Thank you so much for joining the Carnival! What a great post, I think sometimes “creativity” is seen as painting, or making; and yet my blog is one of the most creative things I have ever done… an ongoing exhibition/artwork/book! Cross-stitch is something I still have on my ‘to try’ list. It looks quite therapeutic. I mostly opt for quick and simple crafts these days, but I love the idea of something I could pick up and put down and add to over time. I agree with Emily and you too. I always loved to write, but hadn’t in a long time. Having children gave me something to write about again.